Details at the end of this post on how to win a copy of The Producer’s Daughter, and a link to purchase it. After dropping out of Yale, Hannah Doran fully immersed herself into the lifestyle of a “Hangover Hannah,” the Poor Little Rich Girl Celebrity. The daughter of a famously beautiful heiress and a powerful Hollywood producer, Hannah had everything she could have wanted; except the love of Warren Doran. The acting-out behavior that began as a facade to attract her father’s attention spiraled out of control when the Act became real, and it culminated with her spending fourteen months in prison for grand felony theft. Upon her release, Hannah vowed to clean up her life, mend her relationship with her father, and discover the truth of what happened the night she was arrested. As chapters shift between narratives, readers are given insight into the ruthless, amoral, but always entertaining world of celebrities, Hollywood, and moviemaking. Hannah’s mother brutally committed suicide when Hannah was only four years old, and it is her former “roommates” from prison who become the unlikely sources as to why. An even more unlikely ally appears in the form of Mitch Arpino, a talented photojournalist forced into the often degrading—but very profitable—career as a paparazzo. Through his investigations, readers are also able to methodically assemble the clues to a mystery built upon greed, jealousy, and moral corruption. The truth could shatter all of Hannah’s beliefs about her family, and force her to reevaluate the way she has lived her entire life. I’ve enjoyed this author ever since first reading her Lucy Frampton “Dead is the New Fabulous” mystery series written as Lindsay Maracotta. That sardonic tone continues as the author skillfully creates fully developed, engaging characters while exposing the dark and often absurd side of Hollywood. Truly refreshing is that Marcott avoids portraying Hannah as a victim, as from the moment she steps out of prison Hannah takes control of her life and intelligently solves the puzzle that began decades ago. Only someone with the author’s insider view of Hollywood could so realistically and believably convey the manipulative and complicated machinations of the movie-making business. A thoroughly likable heroine, touch of romance, and voyeuristic glimpse into Hollywood celebrities, ensure for an entertaining and very compelling mystery novel. 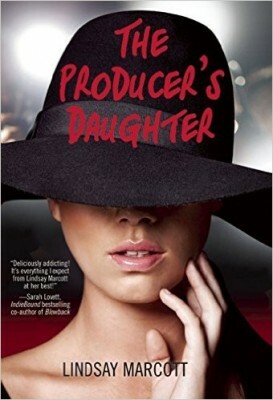 To enter to win a copy of The Producer’s Daughter, simply email KRL at krlcontests@gmail[dot]com by replacing the [dot] with a period, and with the subject line “producers,” or comment on this article. A winner will be chosen December 26, 2015. U.S. residents only. If entering via email please include your mailing address, and if via comment please include your email address. Sounds like an enjoyable read. Merry Christmas. Sounds like a book and author to check out. Thanks for the chance to win a copy.